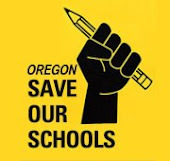 An excellent, well-rounded, and engaging education for ALL of Oregon’s public school students. An end to high-stakes testing used for student, teacher, or school evaluation. Teacher, family, and community input that informs public education policy. Equitable and well-funded schools that support students and classrooms first. An end to corporate education models and top-down government mandates which threaten a strong, democratic, public education system. Proven Reforms: We support the expansion of sensible, research-based reforms, such as pre-K programs, full-day Kindergarten, small classes, parent involvement, strong, experienced teachers, a well-rounded curriculum and evaluation systems that go beyond test scores. Privatization: A strong public education system is fundamental to our democracy. We oppose efforts to privatize public education through the expansion of charters, vouchers or other privately-run programs at the expense of regular public schools.